The Club has excellent facilities with a house at Warneet and a modern aluminium boat for the use of Members. In addition, many Members have their own boats and these often fish together with the Club boats. The expertise of many of our long time Members cover all sorts of fishing and their skills and knowledge are shared freely. Whiting fishing, mostly at Westernport, is our specialty. As you can see from the program, we have various fishing trips, social functions, and other inter-changes. After a new Member joins, his or her nominator will provide continued help. We are a friendly Club and are pleased to note our expanding Membership. Detailed information is available on the website and there will be hard copy postings and emails to members throughout the year. BBQ are generally provided at Angling Competitions and some other events. Regular Club meetings are held at the Waverley RSL in Coleman Parade, Glen Waverley, on the first and third Tuesday of each month, starting at 8.00pm. Meetings cover the status of boating, house matters, social affairs, general Club business and acceptance of nominations from those persons wishing to go fishing with the Club over the following fortnight. The AGM is scheduled for mid August each year. Visitors are welcomed to all Club meetings. Affiliated Memberships are at the discretion of and under the conditions set by the Committee. We are currently accepting applications for Club Membership. Members wishing to go fishing should try to attend the previous Club Meeting to confirm their attendance. If planning a stay at the Club House, confirmationto be sought from the House Captain as to availabilty and booking. If planning on Club Boat useage, confirmation to be sought from Boat Captain as to availability and booking. Usually first in is the rule. Up to 12 persons at house and minimum of 2 and maximum of 4 persons for boat usage at any one time. 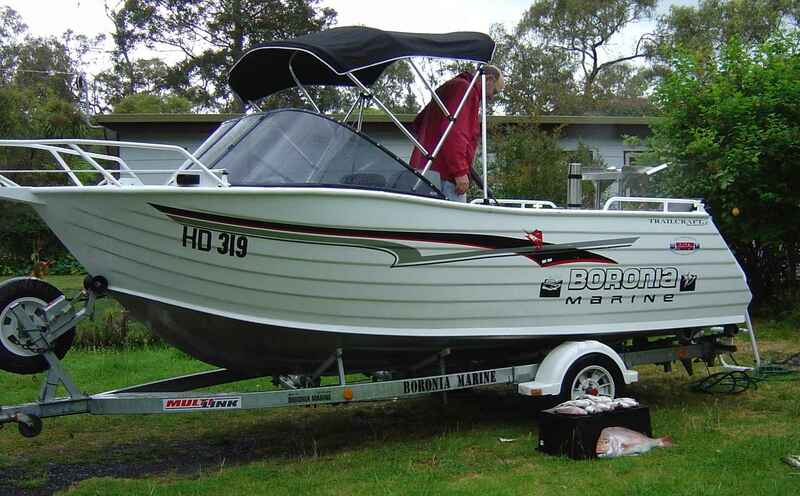 Club Boat is available from Yaringa Boat Harbour, see Boat Captain for details. Visitors are welcome at any time, however after 3 uses of the Clubs facilities they are required to join as a member for any future use of facilities. In nominating for Club trips, Members should familiarize themselves with the boating condition below. Nominations taken at Club Meetings take preference over telephone nominations. Booking for boat trips, in order of preference, is Members, Members immediate families (i.e. partner and siblings) and Member’s visitors. A Member can invite up to 2 visitors per trip. A visitor can have a maximum of 3 boat trips per season & then be given the opportunity to apply to become a Member. Persons between 12 and 17 can be charged at half price but entitled to half their share of the catch. Children must be over 5 years old & be accompanied by a parent or by a person given authority by a parent and with the concurrence of all trip Members. On these occasions, it is the responsibility of the parent to attend to their child’s safety and to provide them with an appropriate lifejacket that must be worn at all times. Individuals must check lifejackets ensuring they are a suitable fit before departing.. (It is reiterated that it is the responsibility of the designated adult to look after their children’s safety and to provide them with appropriate lifejackets that must be worn at all times). For Club Boat booking cancellations, contact the Boat Captain and Yaringa Marina. Members must be at the nominated meeting point 15 minutes prior to departure time. Keeping undersize fish or exceeding bag limits will result in disqualification from fish-off day with deliberate major regulation breaches to be dealt with by the full Committee. Booking for the Club boat is in order of preference, Members, Members immediate families and Members visitors up to a maximum of 2 for any one trip. Visitors are allowed a maximum of 3 trips. When there are multiple consecutive bookings, the Club boat can only be reserved for 1 day at a time. Longer term hiring of the Club boat for fishing away from the Westernport base, is subject to availability and normally is limited to a maximum of 3 consecutive days. Such hiring and usage is at the discretion of the Executive Committee acting on advice from the Boat and Angling Sub-committees. Captains can determine the times for departure and may make other late-stage alterations to plans. It is therefore the responsibility of each trip Member to contact the trip Captain the day before the trip. When launching either Club or Private boats from Warneet, allow 1.5 hours either side of low tide to allow for access to the ramp. Note: the Warneet ramp is closed until at least November 2013. Tide times and tables are available on the Website or from Tackle shops and News-agents. New Members are urged to place themselves on the Trainee Captains list so that they can take out the Club boat. The boat must NOT be taken out when winds are forecast at more than 20 Knots. Pre-booking is required, either at a Club meeting or subsequently from Boat Captain, or if this is not possible, from an authorized Committee Member. Passenger loading is a minimum of 2 and a maximum of 4. The boat is NEVER to be used by only 1 person. order and that the 2 stroke oil tank on motor is at least half full. On returning, lift the motor and tell staff you require boat on hard stand for washing and flushing motor. The cleaning and motor flushing is the responsibility of the Trip Captain NOT Yaringa Marina Staff. Once finished, put on canopy and have a safe trip home. Please Note Club Boat bungs are to be LEFT IN! The Trip Captain fills in trip sheets and delivers them to Neil Rayner at the next meeting .The Trip Captain is to immediately inform the Boat Subcommittee on any maintenance, safety or breakdown issues. As a general rule, trip Captain’s are decided at the previous Club Meeting and confirmed by the Angling Sub-committee Chairman at that time. If you booked in but cannot attend the appropriate club Meeting, then contact the Boat Captain, or his deputy for detailed information, including the Trip Captain’s identity and specific requirements for the trip. Fuel for the Club boat, is provided by the Club and maintained by Yaringa Marina and 2 stroke oil is kept in the boat (if container oil is low, contact the Boat Captain or if urgently required, purchase and show the receipt to the Treasurer for a refund). Bookings are arranged by contacting the House Capatain, A maximum of 12 persons at any one time. Persons who stay overnight are required to fill in the house registry book, (name, date, length of stay). House cost is $20 per person / night. Children under 18 years of age are free. No washing of boats at Club House, motors can be lushed between 7.30am and 6.30pm only. Tank water must be used. House Keys – Can be accessed for a $35 refundable deposit. The boat radios are normally on 27.96Mhz for contact between boats. Channel 27. 88Mhz is for establishing other contacts and emergencies with 27.86Mhz for weather reports and alternative emergencies. Westernport Safety Council can be contacted on 27.88 or on VH channel 16 or by phone on 03 59987221. Water Police phone Nos. are 93997500 or 1800135792. Reporting of illegal fishing dial 13FISH (i.e. 133474).